We tend to think of viruses as nasty germs that we try desperately to get rid of, whether they’re in our bodies, or in our gardens. However, only a small percentage of the many viruses are pathogens, said Marilyn Roossinck, professor of plant pathology and environmental microbiology, and biology. Roossinck recently gave a talk about plant viruses at the Millennium Café, a weekly coffee break and science chat at Penn State’s Millennium Science Complex. In fact, most viruses can work with a plant, as well as fungi, to improve plant health. They can boost heat and drought tolerance of certain plants, for example. Viruses can give plants beauty makeovers, too, that — by the way — can lead to economic bubbles. 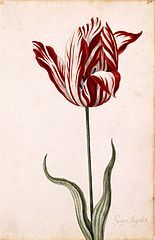 It was this type of viral artistry that helped create Tulip Mania in Holland during the 1630s. The mania began when, as money from trade began to pour into the Netherlands, wealthy people started to build large estates and landscape those properties with exotic plants and flowers. Tulips, especially ones with interesting color patterns, became hot commodities and prices skyrocketed. At one point, tulip bulbs with extraordinary color schemes cost 10 times as much as a worker’s annual salary. The price of some tulips doubled in a few months. The traders had no idea that a virus — often called a tulip-breaking virus — was causing the strange coloring. This wasn’t known for another 250 years, according to Roossinck. In some cases, the virus was spontaneously cured. This led to even more speculation on bulbs — leading to even wilder price gyrations. Prices inevitably increased to a point where there were more sellers than buyers — and the market cratered. The effect of this bursting tulip bubble is still debated. Some say the tulip market’s collapse led to a general economic malaise throughout Holland, while more recent research suggests that the effect of the bubble was isolated to a fairly small group of wealth traders and collectors. This might be a case where the virus wasn’t pathogenic, but human behavior, though, is another story. You can find out more about Roossinck’s research here.